Last week we went to The Web Is, a web conference celebrating 25 years of the WWW. The event is hosted in Cardiff, so Peter and I took the train from Fratton. A 3+ hour journey but no changes so it’s not bad. We met my brother, Nick there. We arrived and checked in to our hotel. There was a pre-conf meet up at the Founder’s Hub for some tabletop games. That was cool, a few web people huddled to play Snake Oil which was similar to Cards Against Humanity but less horrible. After that we walked over to a local pub called the Urban Tap House. Turns out it’s a place for craft beer nerds. We don’t know a lot about beers so the barkeep ended up pouring shots of different ones while we pretended we could tell difference between them. Then we chilled with some more cool cats there. My twin brother and I are both doing web jobs. What’s interesting is I went to Uni to study whereas he started an apprenticeship at a local company. I’m glad I came to University, and I’ve tried to make the most of the opportunities but I don’t think the degree is worth anything on paper. Really enjoyed this talk, Anna talked about game console browsers. I think the main question was: Who uses these devices to browse anyway? It’s a surprising amount and we shouldn’t discount a browser or device just because we don’t use it. Should always consider the target audience for a product. … Annnnd this is a good excuse to get some more consoles in the office. Anna has a game console browsers site with her findings if you’re interested. “97ers” are people born in 1997 and have always had social media in their lives. Emma talked about how Instagram, Twitter and Facebook Snapchat etc. are a key part of their identities and should be taken into consideration when designing and building services in the future. She talked about how they’re discussing bringing voting processes online to encourage them to vote. Mental health is something that’s affected both Peter and I.
Andy invited Chris Murphy (who spoke the day before), Cole Henley, Relly Annett-Baker and Dr. Clare Symons to chat about mental health, in and around the industry. It’s good to see it’s being talked about but Clare noted that it isn’t a industry specific problem. It’s everywhere. 1 in 4 in the UK will experience a mental health issue each year. She did point out that we can spend a lot of time in isolation so that is a potential problem. Talking is often easier with people you feel you can relate to, so I think it’s important that we have issues like this being discussed in groups we’re already apart of. We went to a place called the Live Lounge for a bit of an after party. Legit web stuff of course. Friday was Halloween so I customised my lanyard for extra spooks. These were designed by Portsmouth regular Dan Edwards which is cool to see! One of the problems with iBeacons is you need to download an app for every single place they’re used. 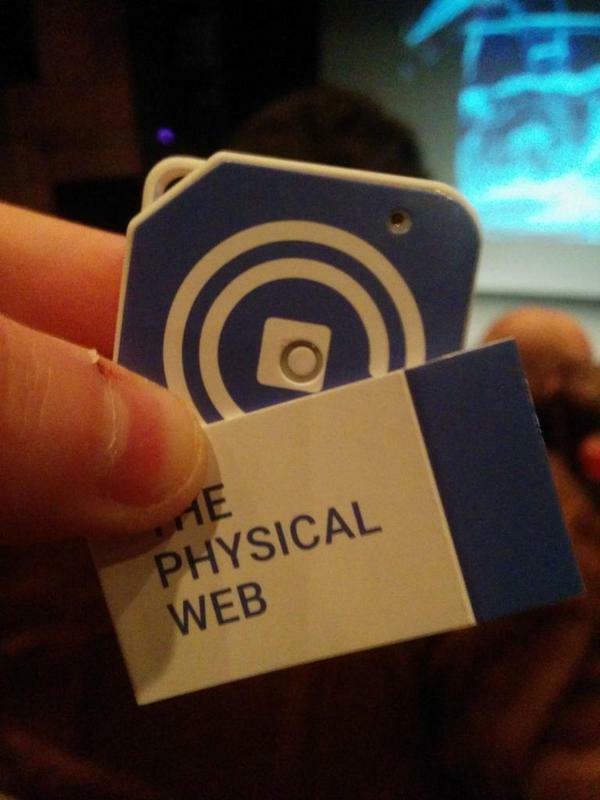 Scott talked about a solution, under the “Physical Web”, using the web instead of apps. He gave out small experimental devices that send out URLs via low-power Bluetooth. The idea being the URL can do many things from as simple as taking you to a website or it could be linked to payment (using PayPal or Stripe possibly). Adam over at Etch wrote some good stuff on this if you want to know more. Lazers were the main point of Seb’s talk… I think. He also makes art seem accessible to coders, which is cool because most people tell themselves they’re not creative. He reminded me of the work that Kawandeep Virdee has been doing in America. Gave me a good dose of inspiration to actually finish some of my pet projects. You wouldn’t have known it was Ben’s first talk. One topic he spoke about the young people in our industry and how a lot of events aren’t tailored to under 18s. After parties are in pubs and bars that they can’t access and the only. He wrote a blog post on this which you should read. Tech is a pretty toxic place at the moment but we’re seeing more talk, events and movements towards making it more inclusive and welcoming. Last time I saw Robin talk was at Altitude in Portsmouth, he always gives a great perspective and reinforces thinking about accessibility from the start. “TAB"s (Temporarily Able-Bodied ), need to take this more seriously. It increases usability to everyone not just those with disabilities. As a blind person, he talked about how tech such as applications that can detect objects via the camera can help immensely for day-to-day tasks. I think maybe Mr Bingo’s talk was one of my favourites. He has this great project called ‘Hate Mail’, where people pay him to send them horrible postcards. For us this conference (and events like these in general) was all about the people, we met some really interesting and cool people. Look forward to the next one. "The Web is... People" by ROSE Digital is licensed under a Creative Commons Attribution-ShareAlike 4.0 International License.